Just the tip. Just for a second. Just to see how it feels. That’s essentially what Batman vs. Superman director Zack Snyder has done for us today. 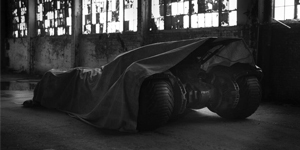 The director posted the below picture on his Twitter account, giving us a slight glimpse of the new Batmobile. Snyder hinted that the full tarp may come off tomorrow, which would be a great way for him to kick off principal photography and get fans even more excited about this film. Looking at it, you can definitely see some Nolan-type influence in the design, at least in the back half. 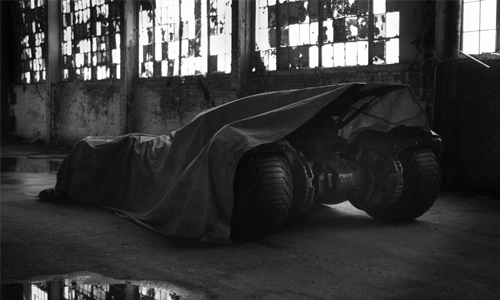 The wheels certainly look like the Tumbler, but the front half seems longer, which seems more in line with the Batmobile from the Tim Burton movies. I guess we’ll have to wait until tomorrow to see if Snyder makes good on his word. What would be even cooler is if we also saw a shot of Ben Affleck’s Batman in front of it. Regardless of if that happens or not, seeing the Batmobile indicates that a picture of Batman is not far behind.